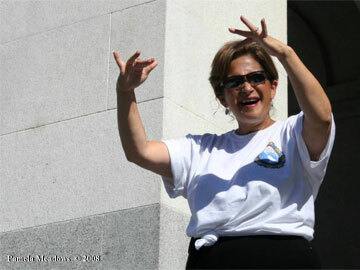 Throughout California's Deaf community and beyond, nationwide, Sheri Ann Farinha is well-known as a dedicated and successful leader, advocate, and lobbyist. She is Chief Executive Officer of NorCal Services for Deaf & Hard of Hearing, headquartered in the Sacramento area, and she has held that influential post since 1993. She's been actively involved with a multitude of causes benefiting the Deaf community, including telecommunications rights, civil rights, and language rights (ASL access) for Deaf children. An alumna of La Sierra High School, she grew up mainstreamed, and attributes her passion for advocacy to her formative years. "I grew up in a family who often discussed politics at the dinner table, die-hard Democrats, involved with every election, learning about the different issues and people.." After entering CSUN in 1979, she began exploring her Deaf identity and learning ASL. Majoring in Deaf Education, she received her Bachelor’s degree in 1983 and Master's in 1984. She joined the staff of GLAD, and acquired and honed her skills with legislative advocacy—and has devoted her career to that. She served as President of California Association of the Deaf from 1989 to 1991. She has two accomplished grown children, Alexandra and Ryan, both CODAs. Among the efforts she's been involved with are pioneering E-9-1-1 access on VRS. She founded and chaired TDI's Stakeholder Council—a group that had its inception in a mother's fury and frustration. When Ryan, who was 3 at the time, fell and hurt himself, she attempted to get help by calling 9-1-1, and got repeatedly hung up on. She ended up taking Ryan to the hospital on her own, and her outrage inspired her to improve 9-1-1 access for deaf people across the nation. TDI asked her to set up the Stakeholder Council. She collected 5,500 signatures on a petition to make VRS mandatory. TDI Executive Director, Claude Stout, has said of her, "She won't take no for an answer." In 2007, TDI honored her with its H. Latham Breunig Humanitarian Award. She received a Trailblazer Award from DeafHope in 2008 for her advocacy for victims of domestic violence (she set up a DV program at NorCal).Among other honors and awards, she received CSUN/NCOD's Distinguished Service Award in 2009. She's been involved with the California Coalition of Agencies Serving the Deaf and Hard of Hearing for 28 years. Another successful advocacy effort that she spearheaded was the Deaf Child's Bill of Rights, which served as a template for adoption by other states. "Though it took us 6 years to get this bill passed due to enormous opposition from the start, the fact is, we did not give up! Now every Deaf child’s language and communication needs must be discussed at every IEP." She recently participated in the effort to defeat Assembly Bill 2072, a disturbingly flawed and biased bill that would have given audiologists and other hearing-industry-related professionals the authority to advise parents of deaf babies on language development and educational placement—subjects that they are unqualified to give advice on. (It's worth noting that the bill was pushed by the oral-school/audiological/CI/AVT lobby, without any input from, or representation of, the ASL-Deaf community, and that California already provides accurate and unbiased information to parents of deaf newborns.) She headed the California Deaf Newborn Identification Advocacy Stakeholder Coalition, a group of advocates, leaders, CODAs, parents of deaf children, and grassroots supporters. Governor Schwarzenegger ultimately vetoed the bill, so as she notes, "we're back to Square One." Now a single mother, she enjoys spending time with Ryan (21) and Alexandra (17), her pets, and, when she can, getting in a bit of snow-skiing and reading mystery novels.